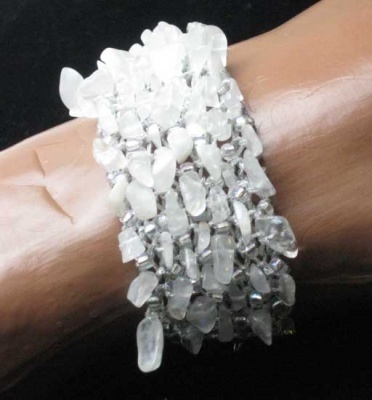 This is one of a lovely line of bracelets with a very simple and oh-so-lovely look. 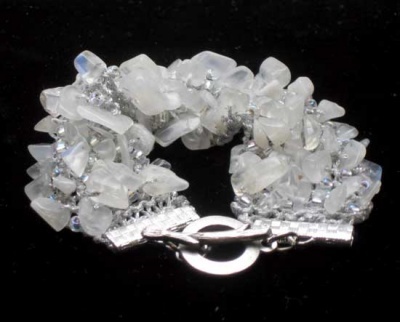 Called River Bed Bracelets, they are made from high quality stone chips of semi-precious stones with size 8/0 beads interspersed. The result reminds me of the intriguing bed of a stream or river, with the many shapes and forms and varying colors formed as the water rushes over. 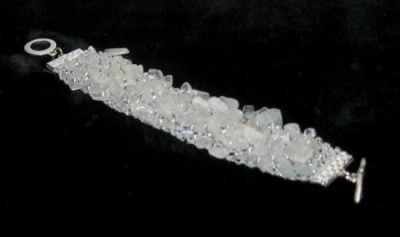 The one on this page is made with Crystal Quartz Chips, roughly 5mm, lovely translucent nugget of crystal that captures the light in a most stunning way. 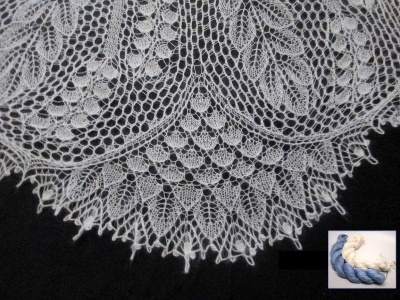 For this one, we chose to a silver thread. Between each quartz chip are interspersed 8/0 beads -- we chose the Silver Lined Crystal AB -- so the whole is very crystal-and-silver. Quite elegant; a sophisticated look. I finished off this one with silver tone clamps at each end, adding the toggle clasp via split rings or jump rings. I feel that this gives a better "finish" to the whole. 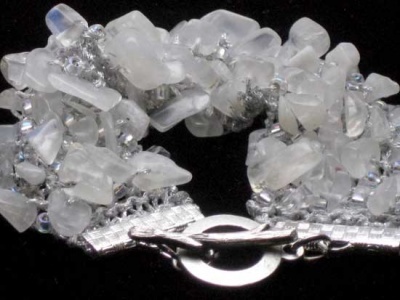 Of course you might choose to simply thread your clasp directly on the bracelet. This kit should make a piece that is roughly 7" to 8" long, depending on your gauge. 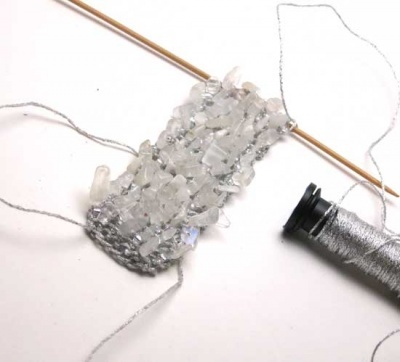 Larger wrists might simply use extra 8/0 beads (included in the kit) at the beginning and at the end to add length to the piece. It would be a slightly different look but we think it would work and look very fine. Everything except the knitting needles (I used size 0/ US 2mm) is included in the kit -- about 150 each of the stone chips, and plenty of the 8/0 beads, the spool of thread and a silver tone toggle clasp (though it might differ from the one seen in these photos) with two clamps and extra rings. 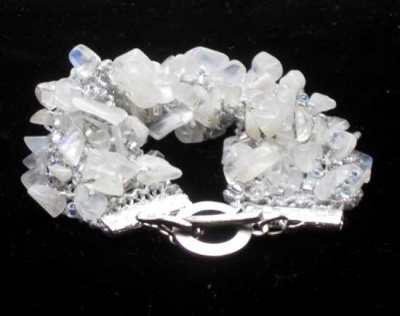 We are delighted with the look of this -- a most intriguing bracelet that draws the eye and is a delight to wear. I know some knitters might already have made similar bracelets or feel competent to knit this without. If you feel you do not need another pattern, simply choose "No Pattern Needed." 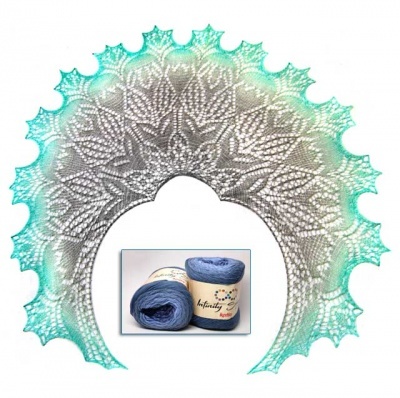 We also can email the pattern to you via email, though I have to do it manually and usually send it right before I mail the kit (please be patient). Just make sure that drop-down menu is set as you would like before you check out.